India and Singapore have both been important for each other even going back to their colonial days. Many Indians who migrated to Singapore after it’s independence from Malaysia have played a key role in making Singapore the financial powerhouse it is today. India recognizes this and has made it easy to get Indian E-Tourist visa for the citizens of Singapore as a part of which ETVs (Electronic Travel Visas) were introduced in 2015. Although the migrants might be Singapore citizens now, there is still a large influx of them visiting India due to their family ties. Since then over 16,000 Singaporeans have applied for Indian E-Visa in 2016. This number is expected to double in 2017. As per the annual reports published by the Bureau of Immigration of the Government of India the number of tourists from Singapore has steadily increased. We had around 17,000 happy customers who availed our visa services in 2017. This article will give you a brief idea on how to apply and what are all the things to be kept in mind before applying for an Indian visa. 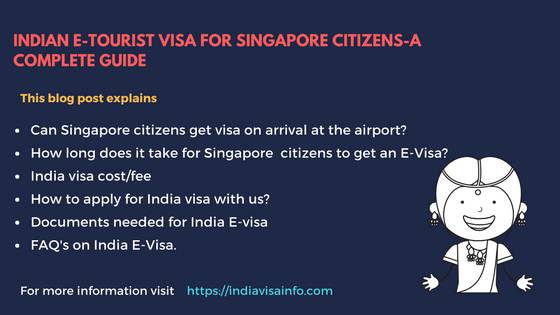 Can citizens of Singapore avail Indian E-Tourist visa on arrival at the airport? Like most of the other countries, Indian government replaced its earlier visa on arrival system with ETVs effective November 2015. Foreign nationals who arrive at India must possess a valid travel document or else they will be deported to their country of origin. E-Visas have to be applied online which takes around 2-4 days to get approved. In fact, airlines will not allow passengers who are flying to India to board the flight unless they hold a valid visa. How long does it take to get my Indian E-Tourist visa as a citizen of Singapore? Once you submit your application you need wait patiently for 2 days. Officers from the concerned department will check for any discrepancies in your application. Therefore, if the officers are in doubt with any information you have given in the application you will be asked to submit additional documents as per the need. It could take anywhere between two to four days to get your E-Visa approved and emailed to you, be patient after you submit your application. What is the difference between an ETV and an Indian E-Tourist visa? ETV stands for Electronic Travel Visa, application for ETVs can only be made online. E-visas are relatively easy to apply and procure compared to Tourist visas which can only be applied at the concerned Indian embassy and cannot be made online.The tourist visa is valid for a period of up to 6 months from the date of arrival in India and it holds multiple entry benefits. Is Indian E-Tourist visa valid for multiple entries? E-tourist visa is a double entry visa like E-Business visa. While E-Medical visas are valid for triple entry benefits. The visas are non-extendable and non-convertible. How long is my Indian E-Tourist visa for? The validity of E-Visa was increased to 60 days from the earlier 30 days. Once you arrive in India and after you go through the immigration clearance your passport and E-Visa will be stamped. The immigration officer will write down the expiry date of your visa on your passport. Therefore, tourists who are in need of a visa with longer validity should apply for a sticker visa at the concerned India Embassy. What is the visa fees for India E-Tourist visa for citizens of Singapore? For Singapore nationals, it costs about SGD33 for India E-Tourist visa. Banks will charge 2.5% of the amount as their service charge. If you want to avail our visa service we charge $25 as our service fee. What all documents are needed to apply for Indian E-Tourist visa for citizens of Singapore? It would be helpful if you keep details of your parent’s passport and your work-related information handy. Your sole objective of visiting India must be for recreation (sightseeing or tours) or casual visit to see friends or relatives. (Remember that tourist E-Visa is NOT valid for employment purposes and NGO/volunteer activities. If you’re a journalist or if you’re visiting India for a conference, there is a separate visa for that which you can apply directly for at an Indian Embassy). Your passport must have at least six (6) months of validity from the date of your arrival in India. The passport should also have at least two (2) blank pages for stamping by the Immigration Officer. You should be having a return ticket or an onward journey ticket and enough money to travel and spend in India. Want to get temporary return ticket to show the immigration officers ? If you hold a Pakistani Passport or your native is Pakistan you are NOT eligible for E-Visa you have to apply for regular Visa at one of the Indian Mission. Your parents or grandparents were NOT born nor have lived in Pakistan. If they are, even if you’re a citizen of the aforementioned eligible countries, you are ineligible to get an online Indian Visa or E-Visa. You will have to apply for regular Visa at one of the Indian Mission. What if I’m in transit to another airport in India, which one to indicate in the form? If you do not stay the transit airport for more than 6 hours you should indicate your last airport in India. How easy is it to apply for India E-Visa for citizens of Singapore? The process of applying for an E-visa is actually pretty easy, the problem lies in the portal where one has to apply. One can expect the website to crash anytime or the worst being the site becoming unresponsive when you are almost at the end of completing your application. One of the major issue faced while applying for an E-Visa online is the unreliability of the payment portal. Unlike the part one application, the maximum permissible attempts to make a successful payment is three. Failure in making a payment for the third time may result in blockade of your application ID. Once your application ID is blocked, you will be redirected back to part one application form. Therefore, you should be very careful while making the payment. You can avail our service to avoid all these hassles, sit back and relax while our dedicated agents do the job for you. You just need to fill in the below form to avail our service. Do I get a discount if I want your assistance only in making the payment? We give a 50% off on our service charge to customers who only want our assistance in making the payment. How many times can I apply for E-Tourist visa in a year as a citizen of Singapore? Foreign nationals can apply/avail Indian visa for a maximum of two times in a calendar year. Therefore, for visas with longer validity and multiple entry benefits, one must apply for sticker visa. or the below mentioned 3 seaports. For medical tourists, separate immigration desks and help centers are there at Delhi, Mumbai, Kolkata, Chennai, Bangalore, and Hyderabad airports. We will need a minimum of 2 working days to procure your E-Visa. Our agents will apply for E-Visa on your behalf once they collect all the necessary information from you. Get in touch with care@indiavisainfo.com or call us at +919632751222 anytime for any help with your visa application process. Best choice for applying for Indian tourist visa is this website. From my experience this guys are really good at this. Initially I had applied through the official website for my Visa application and was got rejected but this guys has done it for me from here.. Its super .. Easiest way to get the Indian tourist visa is to approach this website. It was my second purchase for the E visa which cost me $80 . And this guys are really good at this. Anyone can trust this and move on. I recommend this services for everyone as they deliver good customer value. Good website for India tourist E-visa. Using this services for the second time from this website. Really it was a comfortable purchase of visa from this guys. 100% trustworthy. Wonderful experience for Indian e-visa. Received my visa in short span of time. Really good website and good customer care. The best website to get the Indian tourist visa without any hassle had being experienced. I got my visa very soon after making the payment. Well dedicated customer support is helpful. Thank you for the fast delivery of my visa. Your service and support was really awesome. You customer support people guided me to get my visa easily, they cleared all my doubts. Really good website. Thank you so much. I was checking my inbox right now and I was happy after seeing the visa in my email inbox. Thanks a lot for making it so quick. The one stop solution for Indian tourist visa is here. I didn't asked several questions to the customer support people and they were happily replying to all my queries and their assisted me until I get my visa and also they provided me live updates of my order whenever I asked them. Really good customer support people. The best ever customer support. They really reminded me about the documents needed and also the assisted me in filling the form. From the beginning to the end the assisted me and now I have received my visa. Really I am so thankful to you.